When looking for a helmet, your first priority is FIT. A properly fit helmet will be comfortable, and offer the maximum amount of protection and performance. Be sure to check various models to determine the best fit. Each model has a different shape (oval, round, long), even within the same manufacturer. Measuring Tape: Helmets are sized in centimeters. To determine the correct size, wrap tape around head, just above the eyebrows. Correct size is at point of overlap. Putting on helmet: Align front rim of the helmet above your eyebrows. Hold the straps on both sides and roll the helmet over the back of your head. Check for gaps: Pads should be flush against your cheeks and forehead. The back of the helmet should not touch the nape of your neck. Roll test: With the chin strap fastened your helmet should be snug and comfortable. Try to roll your helmet off your head. If the skin on your forehead moves, you have a good fit. Proper use: Be sure your helmet is fitting above your eyebrows and that your goggles fit your face while wearing your helmet. Helmets come in a variety of styles. Boeri's got some radical styles including the Apollo, Ranger, Shorty Air, Myto Air, Axis, Rage, Kameleon, and Competition. Our Rippin' Riders will be testing the Axis which includes such features as short shell design, removable drop liner, unique chimney venting system, and temperature regulation provided by Outlast micro-fiber technology. Look for our reports in the Rippin' Riders section! 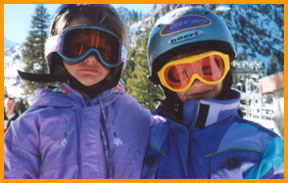 KidzStore- Helmets: Great deals on junior helmets. Article - The Helmet Issue: Should your child wear a helmet? Article: Helmet Fit Fit is the most important thing in helmet purchase. Rippin' Riders Kids Testing Team tests helmets. Boeri Helmets review by the Rippin' Riders Kids Testing Team.